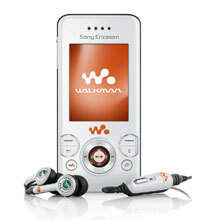 Sony Ericsson Walkman phones bring the ease of digital music players to your mobile. So alongside all the usual advanced phone features, you can also download, stream, store and play back music in your mobile. Memory Stick microM2 included, 12 MB internal. 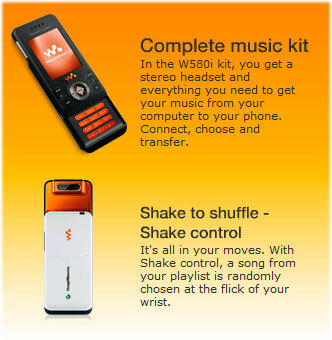 Sony Ericsson Walkman phones bring the ease of digital music players to your mobile. So alongside all the usual advanced phone features, you can also download, stream, store and play back music in your mobile. Disc2Phone CD-ripping software lets you fill your phone with your favourite songs, no fuss. Play your favourite tracks loud and clear through high-quality headphones or external speakers. MegaBass™ adds depth, and stereo widening for a bigger sound. When you hear a song you like but you don't know what it's called, ask TrackID™. Record a few seconds of the song and use TrackID™ to send the music to the Gracenote Mobile MusicID database for recognition. In seconds, you'll have the name, artist and album sent to your phone. 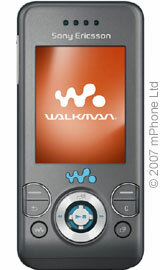 The W580i Walkman phone keeps track of your progress in training. It counts your steps during a day and, if you want it to, the W580i will monitor running speeds and performance. Snap away with the 2-megapixel camera. Use the screen viewfinder, dedicated menus and direct interaction with in-phone imaging and messaging features. Get close with digital zoom. And share: upload your pictures to your personal blog for all to see. Take or choose a photo, add a little text and publish it for friends and family to enjoy. The Sony Ericsson W580i is a stylish slide opening music phone which has been designed to suit all music loving users who like an element of style in their life. The handset is compact & comes with an easy to open slider mechanism which allows the user to view the large colour screen in both its slide open & slide closed position. The phone comes with external navigation & music controls which allows the user to access their menu system even when the handset is closed. The casing has a small tilt at the bottom of the handset which makes opening & handling of the phone easy for the users & adds to the overall look & design of the W580i. The user can access the compact & user friendly numeric keypad by simply sliding their handset open. The phone comes in an urban grey coloured casing which comes complete with turquoise coloured keys or the user may choose the style white coloured casing which comes with bright orange coloured keys. The Sony Ericsson W580i will get all the attention it deserves as it comes in a desirable casing & provides high quality imaging & music features. The W580i is from the Sony Ericsson W range which is a Walkman® music focused range which includes other slide opening handsets including the Sony Ericsson W880i & the Sony Ericsson W850i. The W580i comes with 12 Mbytes of built in memory & with a memory slot which allows the user to add a Micro™ M2™ memory card for further storage. The handset weighs 94 grams in total & is 14 mm in depth, 99 mm in height & 47 mm in width. The Sony Ericsson W580i comes complete with a stereo headset so the user will be ready to enjoy their music & comes with everything the user needs to get their music from their PC or laptop onto their phone. The user simply selects their connectivity option they require, then selects their favourite music & the final step is to transfer the music file. The Walkman® player contains doubles as a media player for streaming movie trailers, the latest sports news, music videos and more. Choose the news and entertainment you want, and have it delivered straight to your mobile phone. Extend a device’s memory with the smallest memory card on the market, Memory Stick Micro™ (M2™) (up to 1GB). Adaptors are available if you want to use with Memory Stick PRO-compatible products. The phone comes with EDGE technology, Bluetooth® technology, USB cable connection, fast port & GPRS. The user can use any of the connectivity options to connect their Sony Ericsson W580i to a compatible PC, laptop or printer to transfer files between devices. The Bluetooth® technology provides a wireless connection between compatible Bluetooth® devices & allows the user to enjoy a tangle free wireless experience. The built in EDGE technology provides a fast & effective transfer speed which allows the user to enjoy a fast experience on their mobile device. The mobile technology does not stop their as the user can access the World Wide Web using the integrated Access NetFront™ Internet browser. 2 mega-pixel digital camera with zoom and secondary video calling camera. Advanced Walkman® 2.0 digital music player with folders for artists and customised playlists. Dedicated music mode and keys. Fast 3G connection - Email attachments are downloaded in no time, websites are accessed in an instant. 1GB Memory Stick PRO Duo with enough memory for up to 50 full-length audio CDs included in box. Bluetooth, GPRS, USB and Infrared connectivity. Stereo FM Radio with RDS. SMS, MMS and Email support. The Sony Ericsson W580i comes with a FM radio feature complete with RDS. The user can simply connect their headphones & activate the FM radio to enjoy their radio experience. The RDS feature allows the user to gain text information which is displayed on the screen & the information is provided by the radio station which includes information on the song being played & more text information from the user to view. The phones main feature is the built in Walkman® music player which will provide the user with high quality sound & a fun music experience. The music player comes with useful music focused features including a TrackID™ music recognition feature, PlayNow™ quick access ringtone feature, MusicDJ™ melody composer feature, Mega Bass™ bass equaliser & Bluetooth® stereo (A2DP) which transmits high quality stereo music from the W580i to the stereo headset.